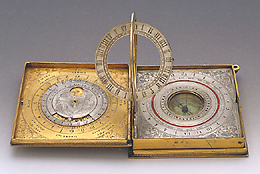 This universal dial has the form of a box divided into three compartments. Each compartment has its own structure and horary or astronomical instruments. There is an astrolabe and a lunar calendar, a compass and sundial, a table for calculating the time and a horary quadrant with a shadow square. The instrument, which bears inscriptions in German, is extremely complex and can be used for a variety of functions. It is finely engraved, as befits a precious and ornate object, typical of princely collections. It was the property of Grand Duke Ferdinand I de' Medici.